The leader of the Buffalo teachers union is calling a proposed contract from the city school district 'absurd.' WBFO's Focus on Education reporter Eileen Buckley says the district has issued a new contract offer to the Buffalo Teachers Federation. Lafayette High School teacher with a student. "This is basically an assault on our contract and has nothing to do with kids," said Phil Rumore, President of the BTF. "When they talk about the teachers are going to have to pay 20% of their health care they end up with hardly any significant increases," said Rumore. "No that's not true. The math is just not right. 20-percent of the health increase insurance contribution does not eat up a 10-percent raise," stated Terry O'Neil, District Chief Negotiator for the city school district. The proposal calls for a 10-percent pay hike, plus a 2.5 percent “step” increase, for 2015-16. Past protests by Buffalo school teachers. The proposed deal calls for a longer-school day to help boost student performance. Rumore disagrees calling for smaller class sizes. 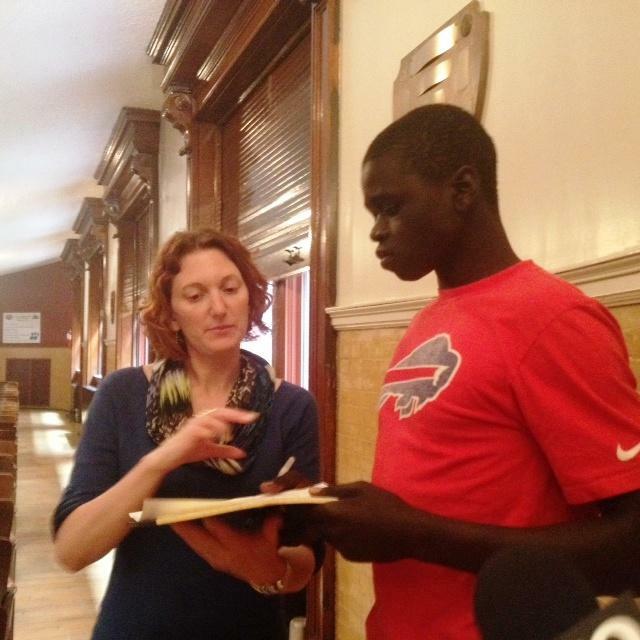 Buffalo school students at the Makowski School. "We're not saying you can't do both," responded O'Neil. "Whether both can be done, I don't know, but certainly if you can accomplish both, it will work better." The District has one of the shortest work days with a number of low performing schools. Still Rumore criticizes the contract. He said it has too many new proposals, including reductions in workers compensation and cuts to sick time. "We are asking for some increases in co-payments for office visits and co-payments for prescription drugs," said O'Neil. "It's not in anywhere near what the teachers deserve," stated Rumore. "If they had to pay 20%, and that's a $10,000 policy, you know, you're talking about a significant amount of money out of their pocket." Rumore said the union will determine if it should file for improper practices for the added proposals. The only thing both sides agree on at this point is getting rid of a controversial cosmetic surgery rider. "Looks like we have a common ground on and that's a good start. One of the bigger of items and short of a thorn in everybody's side for a while," noted O'Neil. Increase the school work year by four days total, from 186 to 190 days, with the ability to schedule the year between Sept. 1 and June 30. Newly hired teachers would work an additional four days to attend orientation and professional development. Increase the length of the school day, from six hours and 50 minutes to seven hours and 40 minutes. Increase the maximum allowable daily teaching periods for secondary teachers (grades seven-12) from five 45-minute periods to six 45-minute periods. Current secondary teachers assigned to teach a sixth period would receive a $5,000 annual stipend. Providing longer work years and days will allow time for the District to require teachers to give students extra help, attend mandatory professional development, allow for common planning time, department meetings, etc. Establish full District control over the transfer process. Seniority should not be the determining factor in the transfer process. Staffing new schools will be based on teacher qualifications. Reduce paid leave time due to an in-school assault or extended illness from five to three years at full salary with benefits. The District will determine beginning and ending times of the work day for each school. Faculty meetings could be held before or after school with at least 10 one-hour meetings per year. The collective bargaining agreement would be clarified to ensure teacher utilization of available technology. Athletic coaches should be selected based on the individual deemed by the District to be “most qualified” for the position. Sick time will be reduced from 12 days a year to 10 in a 190-day work year; personal time will be reduced from five to two days a year and personal days may not be used immediately prior to or after holidays or vacation. The current sick leave bank would be frozen at its current level. The District would also establish an absenteeism control policy to reduce unnecessary sick leave use. All pending litigation would be withdrawn upon settlement. For health insurance, the District is looking at several modifications to keep up with the standard modern workplace. These changes are based on the large increases in health-care costs the District absorbed since 2004. Each of the four health insurance options available to teachers increased dramatically in the last 11 years, a period with low inflation that included the worst recession in 75 years. For single coverage, the District paid on average $3,580 a year per teacher in 2004. By 2015, that increased to $7,186 a year per teacher, an increase of more than 101 percent. For family coverage over the same time period, the annual cost of health insurance the District paid rose from $9,347 to $18,694, a 100 percent jump. New retirees would still be eligible for health insurance, with the District paying 80 percent of premiums after July 1, 2016; retired teachers currently contribute $475 for an individual plan and $950 a year for a family plan. And, prescription co-payments would increase from $5/$10 to $10/$25/$40. The Buffalo Board of Education endorsed the negotiating points at a meeting on May 27 and approved a specific resolution about labor talks with its teachers on June 10. Increase educational opportunity and quality instructional time for students. 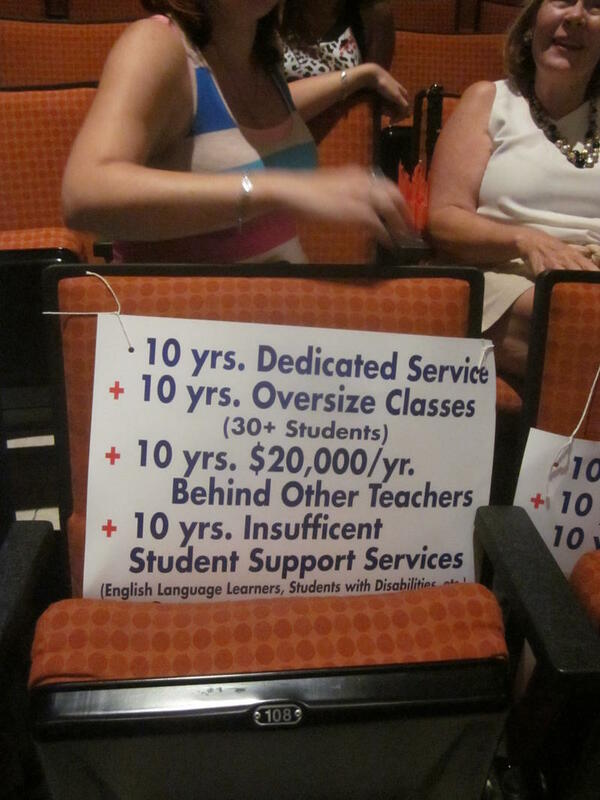 The District and the BTF have planned 10 negotiating sessions between now and August 31. The Buffalo Public School District rejected a recent fact-finding report on their teachers' contract. In this week's Press Pass, WBFO's Eileen Buckley and Buffalo News Education reporter Tiffany Lankes discuss the sticking points anticipated in future contract talks.